Role Management is where you manage individual portal roles. You can create new roles and remove existing roles. You can assign users to roles. The Role Management page is located inside the Jetspeed Administrative Portlets section. 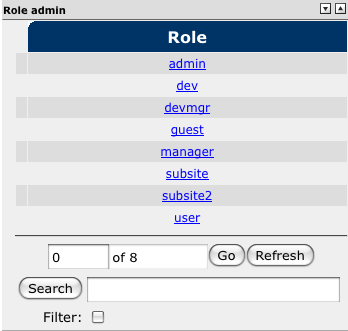 The Role Management page is the second tab on the administrative menu across the top. The Role management section is comprised of two portlets, Role Admin and Role Detail Information. The Role Admin portlet lists all portal roles and allows you to search for a particular role. You can search for a particular role by entering the role name or part of the role name in the search text box. After clicking on the "Search" button, the role listing will show the search results, starting with the user that best matched your search query, followed by the users that normally appear after the matched user in alphabetical order. To get only exact matches when searching for (or part of) a particular role name, check the "filter" checkbox below the search text box. The Role Detail Information portlet allows you to add and/or remove roles. Select a role in the Role admin portlet and the Role Detail Information portlet will update with members of that role. The selected role in the Role admin porlet will now have an arrow marking it. enter a role name and press "Save" (screenshot below). To remove a role from the system, click on the desired role in the Role Admin portlet. A small arrow will appear in front of the role name to indicate it is currently selected, and the role's existing users will be loaded in the Role Details Information portlet. Click the "Remove Role" button. This action is permanent. To add or remove users assigned to a role, click on the role name in the Role Admin portlet. A small arrow will appear in front of the role name to indicate it is currently selected, and the role's existing users will be loaded in the Role Details Information portlet. 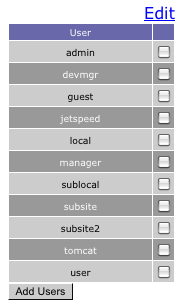 If there are more than ten users assigned to a role in the system, the role listing is spread over several pages each displaying ten users. You can navigate through the pages using the buttons right below the listing. Clicking on the "Refresh" button will reset the user listing to the first page. The Role Detail Information portlet allows you to add users to a role. Select "Add Users to Role". A pop-up window will appear. Check the users you wish to add and click "Add Users". The Role Detail Information portlet will be populated with the selected users. To remove a user from a role, select the user(s) you wish to remove and click on the "Remove Checked Users" button. Be aware that this action is permanent! You can search for a particular user by entering the users name or part of the users name in the search text box. After clicking on the "Search" button, the "Users in Role" listing will show the search results, starting with the user that best matched your search query, followed by the users that normally appear after the matched user in alphabetical order. To get only exact matches when searching for (or part of) a particular user name, check the "filter" checkbox below the search text box. Clicking on the "Refresh" button will reset the group listing to the first page.